101 Ultimate Tips to Travel Philippines Safely and Comfortably! Philippines is an awesome country where we can enjoy different kinds of views. But for some first time tourists, we need to know some tips that will make us play safe in traveling the Philippines while enjoying our precious travel vacation. 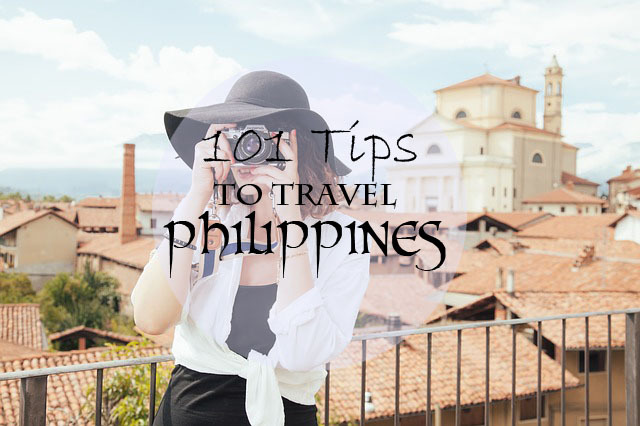 Now let us talk about the 101 Tips that will make our travel Philippines an enjoyable moment. Be knowledgeable with common Public Transportation (i.e: Jeepney, Tricycle, Bus, Trains, Taxi Services). Do NOT allow TAXI drivers to drive you with a FIXED price. Always ask for a “metered service” and a receipt afterwards.Do not forget the receipt. The first kilometer in a Taxi should be 40PHP other than that is illegal. Ask for the taxi to drop you off in a populated area, or an area where a guard may reside (recommended: Bus terminals). White Taxi Cubs are for the common travels, while the Yellow Taxi Cubs are the Airport taxis which are pricey compared to the white ones. Always be aware with your surroundings. Even your seatmate in a public transportation may be a thief, do not judge them by the looks! Heavy traffic is often, so be ready for it. Sometimes walking is faster…but more dangerous. You may choose to ride a train tho. When riding a train (MRT, LRT), you might want to put your bag in front of you so you can see it all the time. Riding in a train will be a bit hard especially in rush hours, but it is still faster than riding a bus. Do not be discouraged by a very long line. When riding a Jeepney, you have to follow some etiquette. You can read the etiquette I wrote in this article. Some drivers will overprice you if they know that you’re a “foreigner”. You have to remind the driver if you have a change. Some actually forgets it…or pretends to forget it? Jeepneys do not have a receipt, do not ask for it. Just in buses, trains and taxi. Eight Pesos (0.18 USD) is the minimum fare for a Jeepney ride. After a 4km travel it adds up a few pesos. And 12 Pesos is the minimum for tricycles. If you encountered some bad driving habits, suspicious drivers and so on, you can call the local LTFRB Hotline 426-2515 or text them instantly at 0921-4487777. Learn to know the Plate Number, body number and any other information about the public transportation that you are riding. It is better that you have a photo or any evidences. Do NOT look clueless when walking down the street. Be more creative on observing your surroundings. Walk straight and move only your eyes in observing landmarks. You can not completely trust even cops and traffic enforcers. Some will misguide tourists. Be ready to ask multiple times in different persons. I suggest to ask mall guards in asking directions. Much safer and you can lose someone easier if you know there is someone that is watching you. Do not wear sparkling jewelries and high end watches because you will be a target for theft or hold ups. Bringing some coins or smaller bills will be really helpful in public transportation. Do not bring DOLLARS! We have an idiom here “Barya lang po sa umaga” which means “to have coins in the morning”. Learn to buy tickets online for domestic Air travels. Protect your travel luggage if you want to do an air travel. I suggest using a hard case bag and lock them properly. Some domestic flights offer discount months before a designated date. You can buy them for as low as 1PHP, other charges are not included tho. Hand carry your gadgets if you want to travel by the air to reduce possibility of damages. You can also ask for a private planes (light aircraft) to allow you to travel into your destinations such as volcanoes and big mountains. Some buses can travel from Luzon to Visayas and Mindanao. If you want to ride there, it will take a day or two before reaching the destination. So bare with it and prepare some meals and stuffs for up to two days. There are some yacht charter that will bring you to beautiful places. Mostly are docked at Batangas and Subic. Bring an mp3 player that can be connected to an earphone, sometimes it is too noisy on the road. This is really helpful! Have a GPS in your smartphone. As well as an offline version of a map. Or a printed map itself. Buy a SIM card that can be used locally (i.e. Globe Telecom, Smart, SUN Cellular etc.). And memorize the number of course. If you have rented a car or has a car that can be used while traveling, be sure to check out your plate number because some cities implement the number coding rule. A certain digit is not allowed during a designated day. Do no leave your windows wide open on heavy traffic, and do not communicate with anyone who passes by and ends up knocking on your window. Some people will try to steal your plate numbers or scratch the car itself, have someone to look in your car. 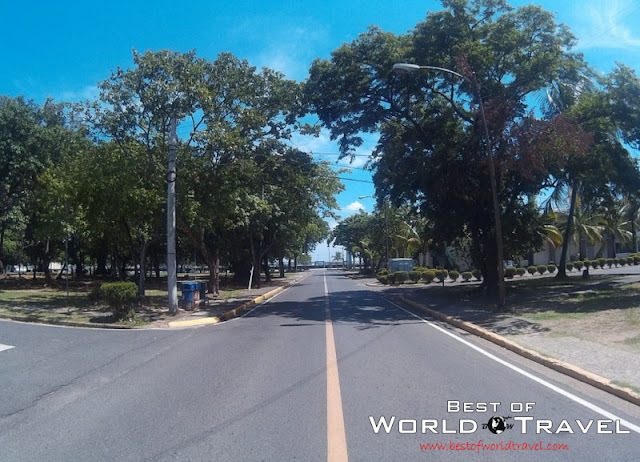 The road driving in the Philippines follows the pattern in which the driver’s seat is located at the left of the car. There will be lots of bumps and poorly created roads, so be careful especially if you can not see well the road. If unfamiliar with the road that you are driving, it is better to have a stopover and take a rest in a cheap or travel hotels. There are lots of cheap hotels in the Philippines where you can enjoy a whole night. Most are located near the bus stations. Notable hotel is the Sogo Hotel where you can cheaply ask for one night stay. Weather or Not to Travel? 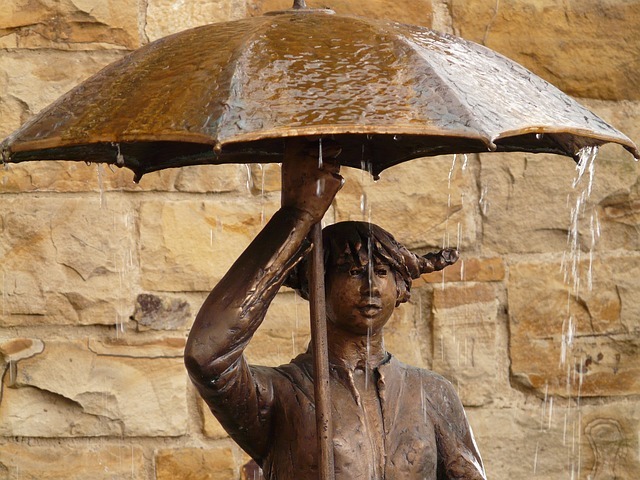 Always bring an umbrella for heat and rain protection. I suggest a small and light umbrella. A visor or bullcap will really really be helpful. Always bring a towel for emergency purposes. If it is raining hard, better to just stay on your bed and take a deep rest, because floods are most probably running outside. December-February are most probably the coldest in the entire year, February-June are the hottest and the rest are just rainy season. For summer travels, always bring a bottled water and refreshments. Floods are actually dirty, so please stay away from them even though there are some kids playing and swimming on it. After a contact with a flood, be sure to clean your feet or take a shower. Put an alcohol afterwards. It is better to be safe than sorry. Wear a very comfortable shoes for easier mobility in the streets. You might run or walk. Be ready to have a protection for your shoes in case a heavy rain will instantly come. You might as well bring a slippers if you do not want your shoes to get soaked in a flood. I suggest a cheap disposable slippers. Always be aware of your bag when walking. Check it from time to time. Seriously. Do not Text-Walk for it is a big thing for thieves. Do not showcase your camera and any other gadgets while walking in a busy street. Use them in a very secure place. When talking to anyone you do no know, for instances like asking for directions, you may call a MAN as “Boss” or “Bossing” (Bos-sing), “Kuya” or “Tol” (means Brother), or “Pogi” that means handsome. And a WOMAN as “Ate”, “te” (means Sister), or just a plain Miss. “Po” and “opo” means nothing at all, they have no meaning, but a way to give respect to elderly. You may use this when paying on a Jeepney. You will actually say, “Bayad ko po!”, which means, “my fare”. Using “ano”, “kuwan” and “uhm” are acceptable in some circumstances. Most Filipino uses this to depict something that is uncertain. Do not be mad if someone used these phrases in front of you. Not all Filipinos are good at speaking English, but it is the second language of the country. If you plan on traveling across Philippines, it is best to learn a few English first. Do not entertain strangers. They may be planning something bad, even street vendors and such. Remember, you are a tourist, a foreigner and unknown to the place. Most foreigners are a target of bad people. Some will mislead you and some will actually befriend you. Foreigners has the image of being “rich” in our country so everything that they know will be used against you in order to get some money. Just be careful. It is best to meet someone you do not know in a populated area like the mall, a restaurant or anything else. Not all Pinoys are bad, just like other countries there are bad and good people. Just be careful in meeting someone. Make sure you have an emergency VISA ATM card/s in your bag. Take note, “VISA”, this will allow you to withdraw cash in most ATM machines. You can try to hide emergency pocket money in different places on your body. It’s up to you or you may check out some of my tips here. Some paper bills are worn out and has some damages, do not accept them if it is too big (damage is more than 10% of the bill). But some people do not accept even a slight damage in the money. Cents are actually disregarded as a coin. If you have a 5 cents, or 10 cents coin, it is better to just drop them on donation boxes. I tried paying 3 pesos full of 5 cents in 7/11 and they did not accept it =_=. There are lots of fast food chains scattered everywhere. You can try eating them if you want. Most fast food chains uses utensils that are only washed and heat treated to kill bacteria. If you are a bit skeptical on these utensils, you can ask for your orders to be “Taken-out” so that they will put your food in a Styrofoam or plastic. Waters in fast food chains are most probably purified. Upon asking for a receipt, just raise your hand, and if someone sees you, draw a rectangle in the air using your two index fingers and two thumbs. Filipinos love White Rice. Almost all Filipinos eat White rice on every meal. Why not try them? 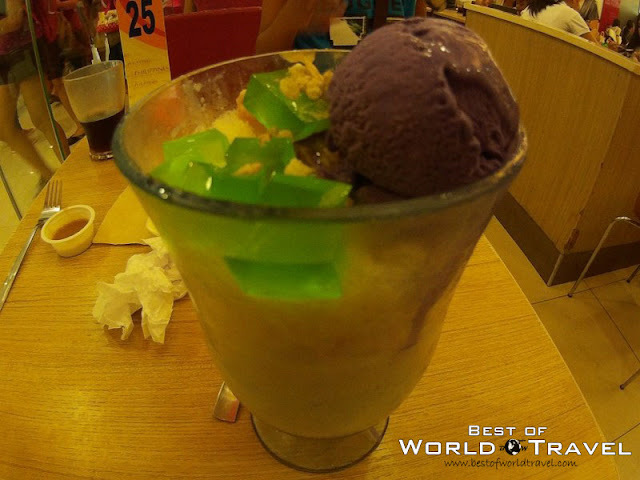 There are lots of Filipino delicacies, and you might as well taste them as you travel from province to province. Some delicacies and foods (especially fruits) are seasonal. One good example is the sweet mango of Zambales that are only present during the summer season. There are some home-made food stalls by the street, some are good some are bad. Some are clean, some are dirty, it is actually up to us to check out if it is clean enough for consumption. They are cheaper than fast food restaurants, btw. Some Filipinos prefer eating bare handed, yes, no tools needed, just the bare hands. Do no freak out upon seeing it. And I actually suggest it for a change! In a restaurant, they will serve you a spoon and fork. Sometimes a combination of both, spork. So learn how to use them. There are some walking vendors that sells distilled waters, juice and other refreshments. I suggest to NOT buy them. Why? Some bottles are not genuine, they just recycled the bottle, put a tap water and it is for sale already. Your stomach might not handle these kind of things. I suggest in buying distilled water in famous stores such as 7/11 and Mini Stop. Can You Actually Rest in the Rest Room? Public toilets are really not a good idea to use, especially if you are a female traveler. Gasoline stations has also some toilets, but it is not as good as the ones inside a fast food restaurants or a mall. Although it is better to be used compared to some public toilets. Some toilets does not have tissues, better check out first if they have some tissues in there. Or you may just buy from a vending machine. Some toilets asks for payment after use, if it is a public toilet, it is NOT mandatory to pay. But for some reasons, sometimes we need to drop off some coins. Most importantly, some toilets has a nonfunctional flush-water system, be careful. Check out the Shopping District! Shopping in a mall needs only patience to find what you want. You may ask the staffs politely and they will guide you. Shopping in a public market / flea market requires determination and strength. You need your powers to carry what you had bought in the market. Some market vendors make their prices set higher, so that customers can barter or ask for a discount (i.e. The price of a tomato is 20 PHP, you can buy it for around 15PHP). Flea markets may be a bit wet and “dirty” for some people, but bare with it. It is more fun in buying here especially in the Market Days. Some stalls (even in malls) sell pirated or unauthentic products (mostly gadgets), so, be sure to check them out first before buying. Philippines is a country with so many malls, you may check every mall if you want to find what best suits your taste. Philippines is not a country that is fully equipped with WiFi. You need to find some stalls that offer WiFi. Malls has WiFi spots, but it is a bit slower than expected especially in peak seasons. So it does not really help with you. Fast Food restaurants has also WiFi capabilities, but the speed depends on the amount of customers present in the food chain. And you need to ask the password in the counter AFTER ordering. If you want to travel with a WiFi with you, you may buy a pocket WiFi, but in some places it is unreliable. But it is better to have one than nothing at all. This may cost a bit but it may be good for other travelers. (Estimated cost: 2000 PHP or 50-60USD). You may check this helpful Internet Tool to find how much speed you actually need. The internet in the Philippines is a bit slower compared to many countries. You can find an injured crawling turtle to be faster than the internet. Seriously. There are lots of computer shops / internet cafe scattered in the Philippines, you may use them by paying in hourly rate. (15-20PHP per hour). In case there is something bad that happens, call as soon as possible to any of your reliable friends or relatives. 911 will not actually work in the Philippines, some says you can dial 117 for emergency, but does not actually know if it is working. So~ bare with it! It’s better to know the local police hotlines. It is better to bring a pepper spray for girl’s self defense.